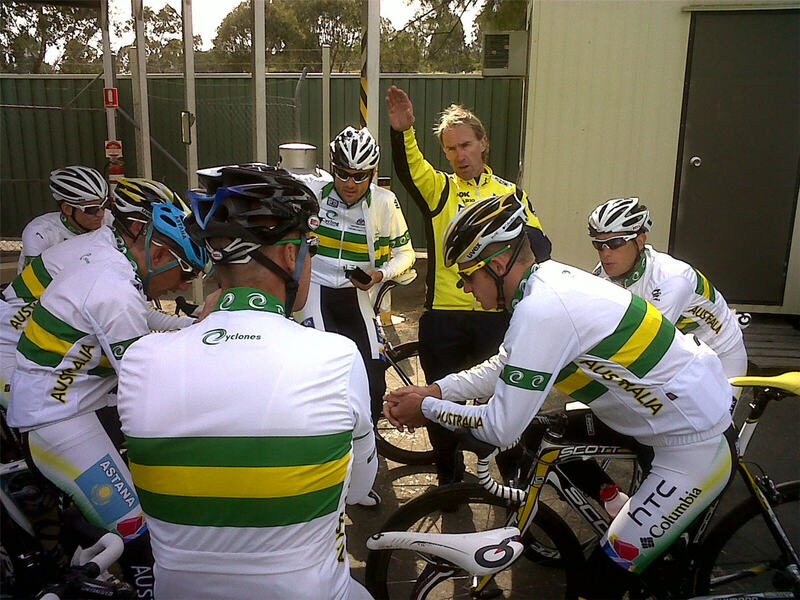 Firstly there is getting to know the staff and riders much better than the nods and “hellos” that most Australians tend to throw at each other when bumping into each other on the normal pro circuit. Secondly there is the slow build of excitement for one of the key races of the cycling season, with our team being both the home nation, and also sporting the defending champion. It’s absolutely awesome! I’ve had two personal highlights thus far this week. The first was discovering that Allan “Alby” Davis is a bigger St George Dragons fan than I am, meaning, we have had a week of gasbagging about how the Dragons are going to go in the NRL Grand Final this weekend. As there are no race radios and the Grand Final will be on at the same time as the Road Race this Sunday, Alby and I are trying to work out a system where I can let him know what the score is while the race rolls around. Singing in the ‘key of angry’. Motor racing pit boards are our best idea thus far, although where we’ll get one of these from is anyone’s guess. Anyone who has spares near Geelong would be massively appreciated! The second highlight was discovering that Richie Porte was at the Tour de Langkawi last year when I did a rendition of “Total Eclipse of the Heart” with a live backing band in the “key of angry” (as described by my fiancée Mands). Well, that he was there wasn’t the highlight, but that he recognised me as “that Total Eclipse of the Heart guy” was. Absolutely chuffed with that! And it goes to show, it’s not singing ability, but passion on delivery that counts! One of the funnier parts of the week for mine has been listening to the gossip and rumours that each of the teams have about each other. “We heard your bus has a frozen yoghurt machine”, “didn’t your director make so-and-so ride home because they were fat?”, “I heard you blokes sacrificed a chicken every stage that you won” and so on. 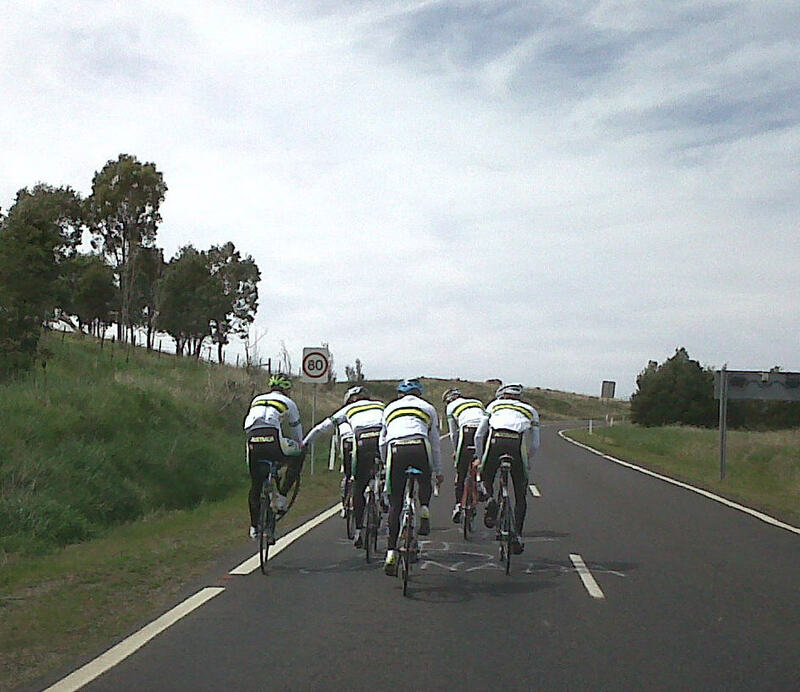 The road race team have been based at the AIS (Australian Institute of Sport) in Canberra for the whole week, and we head down to Melbourne tomorrow (Friday) in prep for the race starting on Sunday. The week has consisted of a bit of team bonding, a lot of riding for the lads, and a bit of work for me, but nothing too drastic (thankfully). The team bonding had us in a talk with a former wing commander of the Australian Airforce, which was absolutely fantastic. His quote of “first we break them, then we build them back up” has been used throughout the week to describe pretty much any plan we have to do any thing. Very cool. The training that the boys have done has been interesting. The TT lads (Richie Porte and Mick Rogers) obviously have been going through a lot of shorter, more intense work, while the road race boys have done longer, tougher stuff. Individual riders have tweaked the final week’s programme individually depending on what works best for them, what sort of racing they have had in their legs in the month immediately prior to this week, and what type of a rider they are. It’s been a juggling act handled with aplomb by our DS Neil Stephens and physiologist Dave Martin. Matty Hayman chuckin a mono. We’ve had a good start to the Championships — Luke Durbridge ripping up a silver in the U/23 TT, and Rohan Dennis taking 4th, while Richie Porte and Mick Rogers came in 4th and 5th today in the Elite TT. It was an interesting day for me, as Dave Millar was in the lead for a large part of the day, and I found myself cheering for Millar (who is a friend and team mate every other week of the year), while also hoping that Mick and Richie would go super well. It’s all a little confusing, but for me it means I have more chances of a result I’ll be happy with occurring. First and foremost will be an Aussie win, but if one of the lads from Garmin-Transitions gets up instead, it’ll be a pretty good consolation result. In a recent article about the Tour de Trossachs I became side-tracked onto the year 1978 and mentioned, amongst other things, the Scottish Milk Race - back when Scotland had a National Stage Race, and for quite a few years before and after. Here I have a look at a few editions of the Milk Race and the Scottish Health Race, where Scotland managed to have a home win with Jamie McGahan in 1983.